Digestion is the chemical breakdown of the ingested food into absorbable molecules. Absorption refers to the movement of nutrients, water and electrolytes from the lumen of the small intestine into the cell, then into the blood. In this article, we will look at the digestion and absorption of carbohydrates, protein and lipids. There are three carbohydrate products which are absorbed by the small intestine; glucose, galactose and fructose. Digestion of starch is initiated in the mouth, facilitated by salivary amylase. The majority of carbohydrate digestion occurs in the stomach and duodenum. The main enzyme is pancreatic amylase, which yields disaccharides from starch by digesting the alpha 1-4 glycosidic bonds. The diasaccharides produced (alpha-dextrinase, maltase and sucrase) are all converted to glucose by brush border enzymes. Disaccharides occurring naturally in food do not require amylase to break them down. Brush border enzymes (lactase, sucrase, trehalase) hydrolyse these compounds into molecules of glucose, galactose and fructose. Glucose and galactose are absorbed across the apical membrane by secondary active transport (along with Na+) through the Sodium-Glucose cotransporter (SGLT1). Both glucose and galactose exit the cell via GLUT2 receptors across the basolateral membrane into the blood. Fructose enters the cell by facilitated diffusion via GLUT5 and is transported into the blood via GLUT2 receptors. 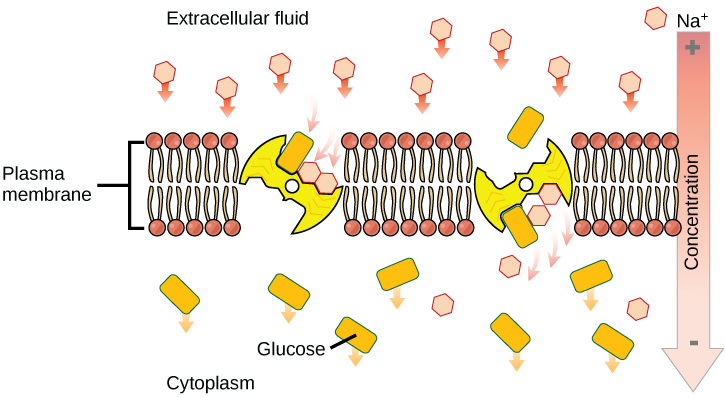 Fig 1 – Sodium moves down its concentration gradient, bringing in glucose to the the cell. Protein digestion begins in the stomach with the action of pepsin, which breaks protein into amino acids and oligopeptides. The process of digestion is completed in the small intestine with brush border and pancreatic enzymes. They split the oligopeptides into amino acids, dipeptides and tripeptides. Amino acids are absorbed via a Sodium cotransporter, in a similar mechanism to the monosaccharides. They are then transported across the basolateral membrane via facilitated diffusion. Di and tripeptides are absorbed via separate H+ dependent cotransporters and once inside the cell are hydrolysed to amino acids. 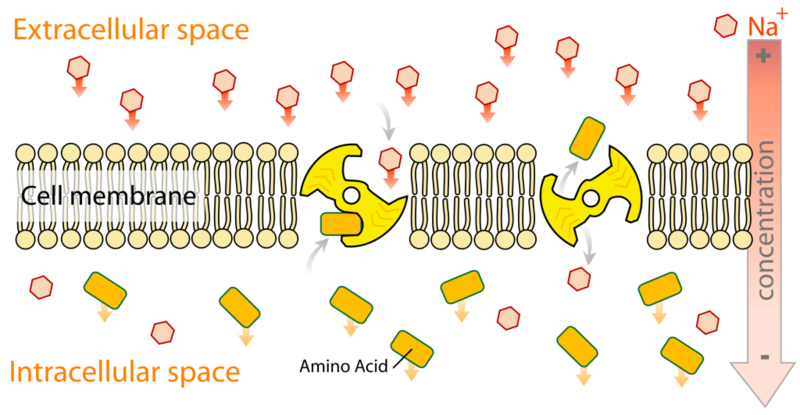 Fig 2 – The sodium-amino acid transporter, which is nearly identical to the sodium-glucose transporter. 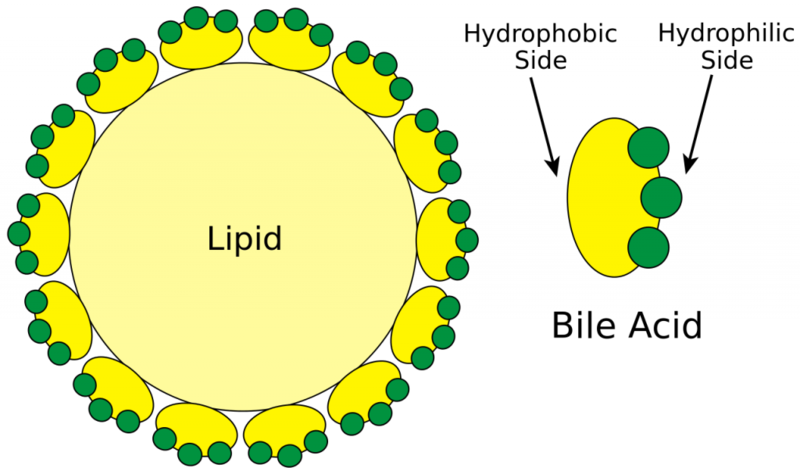 Lipids are hydrophobic, and thus are poorly soluble in the aqueous environment of the digestive tract. Their digestion is started by lingual and gastric lipases, but this only digests 10% of ingested lipids. The remainder of the lipids are digested in the small intestine. Here, bile aids digestion by emulsifying the fat goblets into smaller chunks, called micelles, which have a much larger surface area. Pancreatic lipase, phospholipase A2 and cholesterol ester hydrolase (3 major enzymes involved in lipid digestion) hydrolyse the micelles, breaking them down into fatty acids, monoglycerides, cholesterol and lysolecithin. The products from digestion are released at the apical membrane and diffuse into the enterocyte. Inside the cell, the products are re-esterified to form the original lipids, triglycerides, cholesterol and phospholipids. The lipids are then packaged inside apoproteins to form a chylomicron. The chylomicrons are too large to enter circulation, so they enter lymphatic system via lacteals. Fig 3 – The action of bile acids. By enveloping the lipid, the bile enhances absorption. Steatorrhea is due to a disruption to the normal absorption of lipids, leading to fat filled faeces. There are numerous underlying causes for this such as pancreatitis, which prevents the correct secretion of pancreatic lipase and so lipids remain undigested. Another cause is gallstones which prevent bile from entering the duodenum and again prevents maximal absorption of lipids. However, the absorption in the small intestine can be compromised, such as in inflammatory bowel diseases. To distinguish between the underlying causes of Steatorrhea, the small intestine and biliary tree must be visualised. The small intestine can be visualised via endoscopy or radiography whilst the biliary tree can be visualised with endoscopic retrograde cholangiopancreatography. What transporters does glucose exit the cell through? What ions are dipipetides co-transported with? Which of the following is not a cause of steatorrhoea?